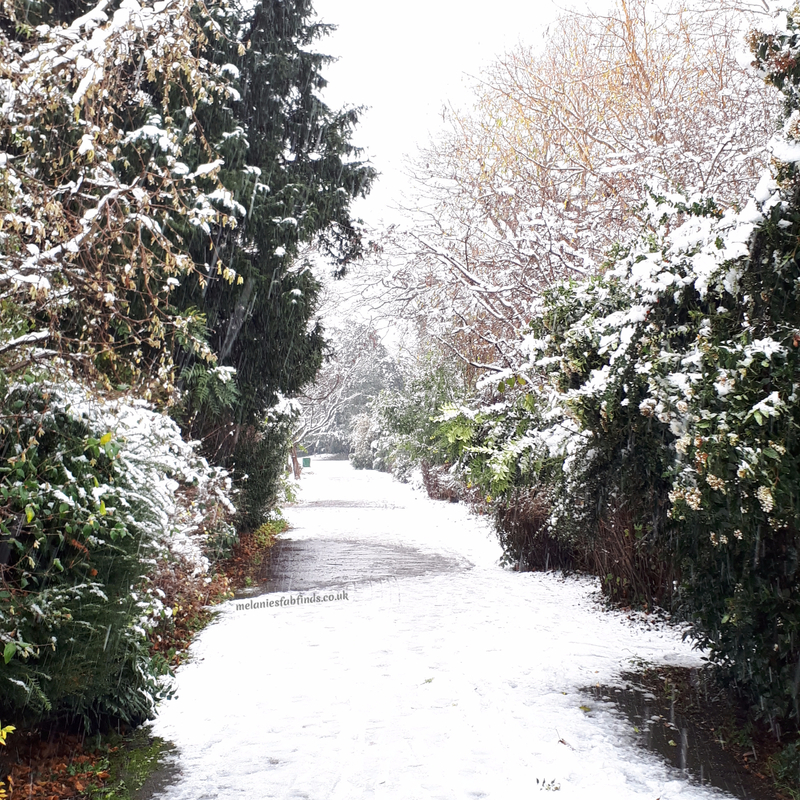 The snow has made it to London, I repeat the snow has made it too London and I’m super excited about it. London looks lovely with a dusting of the shimmery white stuff and it makes it feel so much more Christmassy. The children couldn’t wait to go out and play and dressed shockingly fast, wish they’d do that on a school morning. Looking through my wardrobe I didn’t find many warm jumpers myself. Having been running around preparing for Christmas, making sure the children had enough clothing etc. I did what many of us mums do which is to neglect myself by not making sure my wardrobe is ready for the winter months. Nothing new there. As parents we put our families needs ahead of our own but now I am left with the dilemma of what to wear. I’m finding myself wearing the same few woolly jumpers day after day wash cycle permitting. Just a few days back one of the jumpers in rotation which I will admit was falling apart a bit already emerged from the drier with a tear from the top to bottom at the side rendering it useless and so straight in the trash it went. Well actually into the recycling as we try to be as green as possible. I bought some great jumpers last year this time from H&M so I thought why not take a look and see what else they had that would catch my eye and keep me toasty warm in the freezing cold weather. I loved the look of this long knitted hooded jumper (in grey marl). It’s perfect to snuggle up in and I can fit a layer or two under it to make sure that I trap in that heat. Yes, my dear readers I mastered the art of layering from childhood thankfully and use it to my advantage. This has a kangaroo pocket to tuck hands in that might need warming too which is really convenient. To add to that it has long sleeves with thumb holes so it’s almost like wearing fingerless gloves. How fantastic does that sound I mean seriously you can’t get much better than that. The only draw back is it only comes in one colour which is a shame as I could have filled my wardrobe with a variety of colours of it easily. It’s a bargain at £24.99. Polo neck jumpers are always good for keeping one warm in the winter. I need to add a little colour to my wardrobe and I think the plum knitted polo neck jumper will do the job. The soft knit jumper is nice and long to keep the wearer warm. It’s perfect for a relaxed casual look and again just £24.99. I love the pretty feminine feel to this powder pink glittery jumper. This long, soft knit jumper is ribbed around the neckline, cuffs and hem. Some of the glittery tops I have seen in stores are over the top with what looks like a top made of tinsel. This has a more subtle use of metallised fibre that looks pretty and not excessive to give a more sophisticated appearance. This one comes in a little cheaper at £17.99 which is great. I need to hurry and get to a store so I can try one on. Another long jumper this rib-knit jumper in a soft cotton-blend with long raglan sleeves, ribbed cuffs, and slits in the sides is perfect to replace the one that I have just disposed of. It’s a new arrival online and priced at £17.99, I hope they have it in store too. Last but not least this grey fitted turtle neck jumper in a rib-knit viscose blend with long sleeves looks really warm and flattering to the figure. Another one at just £17.99 and it’s also available in black!!!! These can all be styled with jeans or leggings and a pair of boots and make a great choice for the winter weather. The selection featured were my favourites from the long thicker jumpers from the website and to be honest I’m looking forward to getting myself to a store soon so I can try them all on. Wish me luck I am hoping to be restocking on jumpers very soon. What style of woolly / knitted jumper do you gravitate towards? Oh my WORD! I love these. LOVE them. I’m on the H&M site right now and going to order a few bits. I love that grey jumper. The zips down either side are so unusual and I agree it is a fab price too! There is nothing like a nice warm thick jumper and these ones from H&M look wonderful I love the first one with the zip detailing! I love a good jumper at this time of year and I’m all heart eyes over that second jumper! I’d find a place for all of these in my wardrobe but that second one is gorgeous. Oh gosh, I love that knitted hooded jumper. I’m off to H&M tomorrow actually as I’ve seen a gorgeous penguin jumper I want to get my son….I think I’m going to have to get that grey jumper for me now, it looks so cosy. I like that you chose comfortable jumpers that focus more on keeping you warm that on fancy looks. I am not a fan of neck jumpers, as most of them make my skin itchy, but I love all the other ones. Grey is a great color for a comfy winter jumper as well. Burgundy colours are great for this time of year. I think you may have just persuaded me to buy more jumpers. I have so many yet I keep seeing new ones that I can’t forget about. I love that last grey one, would go with loads of things! It’s great isn’t it. I went to a store yesterday to get one but there didn’t have any. I was gutted. That long black rib knit jumper looks like something I need to keep warm this winter. It is a lovely one. I need a few. These all look great picks, I really like the grey hooded jumper. Chunky knitwear is my favourite at this time of year. I love chunky ones too although I couldn’t find many in stores. I seriously LIVE in H&M sweaters in the winter! They are so cozy, I love it! They do have a great range of jumpers don’t they. Ha, I know what you mean. I tried to get one instore but they didn’t have any. I was gutted. I love grey jumpers ad there is a good range of grey ones available too which is great. I would usually go straight for the burgundy one but I love that grey marl one with the thumb hole! It looks so snug and warm!